If you didn’t spend your complete lottery tickets budget yet, now’s the time to cash in with the incredible US Mega Millions lottery jackpot! We witnessed an unbelievably exciting lottery draw on Tuesday, January 13th at 11 PM, ET. When the announcer called out the winning numbers (12-20-25-50-51 and Mega Ball number 7), everyone was anxiously scanning their tickets, hoping to hit that magical combination. But the Mega Millions jackpot proved elusive once again. Now, it’s enticing even more players into the fold with an incredible $270 million jackpot prize, or a lump sum cash amount of $177 million. Come Friday the 16th January at 11 PM, ET, there may well be celebrations from Perth to Sydney when a lucky Aussie player snags this insanely large jackpot! This week’s first draw was tense… really tense! With so much money on the line, there were large numbers of lottery players seeking their fortune. And, in true Mega Millions style, the result wasn’t disappointing. This last drawing made six people overnight millionaires with one Megaplier winner scooping up a massive $5 million prize. Add to that 57 winners with a prize amount of $5,000 and 7 Megaplier winners claiming $25,000 a pop. It’s clear that no other lottery game pays out as much, as frequently as the Mega Millions lottery. In total, over 3.4 million people won prizes ranguing from a mere dollar to $5 million in the Tuesday drawing – incredible by anyone’s admission. 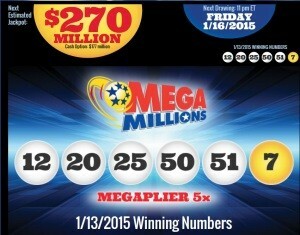 The Mega Millions is one of those lotteries that requires you to be in it to win it. And all that’s needed is a ticket. There are 2 sets of numbers in the Mega Millions lottery: one set of numbers is drawn from a pool (1 – 75) and the second number – the Mega Ball – is drawn from a set of numbers (1 – 15). The yellow Mega Ball completes the full range of six numbers needed to win the Mega Millions jackpot. However, there’s a nifty added extra available to players in the form of the Megaplier, which multiplies your prize between x1 and x5 – for just a small additional fee. With the Megaplier you can increase all secondary prizes by the Megaplier multiple times! Without further ado, get your tickets to the next Mega Millions jackpot – this one’s ready to pop!